Last few days I did some code maintainance for Competition Doom so I've managed to build Competition Doom based on Chocolate Doom v2. Quickstart is bugged, not sure why, have to investigate a bit. Anyway I'm trying to figure things out, and hoping I'll be able to do more soon. I found one nice launcher code (C#) so I've decided to tune it a bit and release it. In future it could be part of Competition Doom package but conversion to C++ is needed. Unfortunately program works only in Microsoft Windows. Maybe it works in Wine but I didn't test it. I found it very easy to use and useful for playing and recording demos. If you have ideas or suggestions feel free to send some. That launcher looks pretty much like what I hoped it'd be, now if I could only figure out how it works I can't seem to get cndoom.exe to work for some reason. I have it in the same directory with cndoom. What os do you have? And whats the path to cndoom? I put the launcher in the same directory as cndoom, set the path to cndoom.exe and the wad files, I can choose the wad and all the other options, but when I hit "play" nothing happens. A command prompt window with cndoom.exe just pops up for a second and then disappears. If I try to run cndoom.exe by itself with parameters or not nothing happens either. This is on windows 7. Oh, then I guess you are troubled with cndoom, not launcher. I'm already aware of that problem. Anyway, which cndoom version you are trying to run with it? Try 0.2.4 v2, and use SDL libraries from chocolate doom since I was reported that libraries shiped with cndoom are somehow bad . I'm working on 0.2.5 v1 right now so please be patient, it will be worth to wait few days (18.08. let's hope nothing goes wrong). Launcher v1.4 released, a bit "redesigned" and fixed Doom 1 warping. New versions of Competition Doom is released, both v1 and v2. Please test v1.2.5 beta as I'm about to release it soon if there will be no problems with playing and recording demos. ps. it works on win98 too, .net 2.0 required! I'm preparing new database and upload so please report bugs found in cndoom. I've tested win98 and win7 64 bit and was reported it works on nt 3.51 and xp too. Anyone with win7 32 bit and win8? CNDOOM v2.0.2 is going to be released soon, before public release we will have internal recording for initial database submission and testing how the whole stuff works. If you want to be part of team and want to record demos before anyone else, contact me. Your future plan for Compet-N looks opaque. I want to know why you introduced Competition Doom. It's for competing for milli-second unit, isn't it? Yes, it is valuable because many records of UV-Speed and NM-Speed seem to be unbeatable by second unit, though it is just an amateur view. I say my opinion as a player who mainly plays UV-Max. I think UV-Max records don't reach milli-second domain and there is no compatibility between records for Compet-N and CNDoom. I therefore still select to record a demo for Compet-N. New Sedlo's demos are great, but it doesn't enter into Compet-N under the present rule. Records will vaguely separate between two databases. If it's not suitable to discuss it here, please make a thread in another forum (COMPET-N discussion). I've moved your post here so RSS is not spammed. COMPET-N and Competition Doom are two different things. COMPET-N is legacy and has it's own database for vanilla doom2.exe demos only, it has its quirks as it's not easy to play under DOSBox and I don't know anybody with Windows 98 machine so I consider it as "old" COMPET-N, but hey don't stop recording for vanilla, it's still here, and I'll check demos as I did till now. Nothing changed regarding true COMPET-N. Vanilla only. That's why new Competition is named "CNDOOM". Why new client and new database? First, I hate to play under DOSBox, it's laggy it's buggy, its terrible but I have Windows 98 PC with DOS but last time I started it was ~5 months ago. I know there are more people annoyed with the fact that they can record only doom2.exe demos. Having that in mind and chatting on IRC with Anders and xttl, xttl told us he could fix a bit Chocolate Doom, and after some time he did implement Quickstart, stats, timer and metadata. While he was coding I was asking people would they play if we release new clean database with new client that will work on any system and demos will be 99.9% compatible with doom2.exe (ExM8 and Ultimate Doom movie are now possible with new client). People said yes and liked the idea, so I continued to work on it and this is the result. You can't compare Vanilla/doom2.exe demos to Competition Doom or prboom+ or Chocolate. One new fact is that episode and movie runs will have higher times now because milliseconds are counted too so in vanilla 27 + 31 = 57, and cndoom 27.91 + 31.97 = 58.88! Max runs don't need milliseconds that's true but milliseconds are here so you almost never can say this is unbeatable (MAP01). Other than that, players didn't want to bother with DOSBox, this is their chance. I don't know how it will go, maybe it will die and we will fall back to COMPET-N maybe it will be a success, maybe both databases will survive. Time will tell. OK! I a little understood your intention. I don't intend to object to competition of every category by milli-second unit. Like I said before, UV-Max records don't reach milli-second domain, so I'm not dissatisfied with competition by second unit. I'm just not willing to record a demo with CNDoom with demerit of undoing a original compet-N entry. Making a new port customized for competition is a good idea, but I still stay vanilla doom. cool, as I said new database is just a chance for everyone else who dont like playing under dosbox/doom2.exe and are crazy enough to beat records in ms, hehe. I should and will clarify it in rules/wiki. I'm sorry about that, but I'm busy busy..
Nice to see this finally released. That launcher looks very similar to the one I use. I'm glad that there's an alternative now and I'll see if I can submit a couple of demos tonight. Have you thought about perhaps submitting this announcement to DW news submissions in order to attract more attention? I posted it on dw forums. I was expecting someone will make news out of that. Dunno really, should I contact somebody for that or? fx wrote: I posted it on dw forums. I was expecting someone will make news out of that. Dunno really, should I contact somebody for that or? I think you may have posted in the Doom speed demos which should have been good enough really. There is a news submission part of the forum where you can post and if it's seen as "news worthy" it will be transferred to "Doomworld News". About contacting, I don't think you need to contact anyone you can possibly ask Manc or even Bloodshedder via PM about it as I see they deal with the news section since Ditto left. Im new in speedrunning and i want to tell that CNdoom is a great port for me. All is clear and easy to use. Thank you for that. Is CNdoom work online for coop run ? It should work but not for competition as it's not implemented at all (yet), if you want to play for fun you should use Chocolate Doom. If anyone is interested I've released a new version. This is beta release and it need to be tested. It's just merged with latest chocolate doom and high resolution is implemented. Do not record demos and try to submit them as they will not be accepted with this version! Build updated with high resolution Heretic and Hexen and few fixes. Latest cndoom build includes high resolution for all games (doom, heretic, hexen and strife), raised limits for strife, new option to show secrets while demo is playing and few bug fixes. 1. The launcher doesn't launch my PWADs. It sees them, but when I select a PWAD and press play, it just launches the IWAD without the PWAD. Also, I can't launch cndoom.exe directly at all. 2. I play in windowed mode, and the launcher automatically places the game window at the bottom of my screen, so my taskbar blocks part of the screen. Also, I noticed that Scythe was added to the database, but there is no upload button for Compet-N for Scythe yet. Are you still working on implementing that? 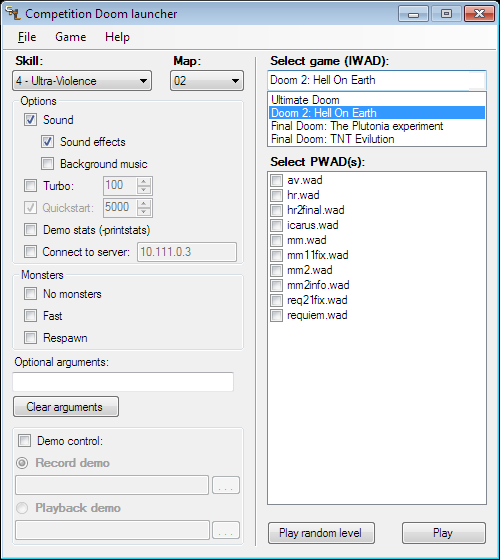 Finally, I noticed that the CNDoom database also has sections for PWADs; does that mean that it is now possible to upload CNDoom demos for PWADs? By the way, I'm liking the changes to the database UI so far, definitely easier to use. 1. Which version of cndoom and cnlauncher are you trying? Right click Properties on cndoom.exe and under Details File version should be 2.0.3.0, cnalunch.exe should be 1.4.3.0. 2. What's the full path to cndoom.exe, cnalunch.exe, IWAD and PWAD files? Are they all in the same directory or somewhere else? 3. Your OS (win98, xp, 7, 8, 7 64bit, 8 64bit, ubuntu, macox v,...)? I really don't know why it's at the bottom of your screen, do you have two monitors? When I start in windowed mode it's centered. 1. Remove all cfg files and run setup to create new ones? You noticed Schyte, well, I have to see if I'll allow records for it as I really don't want to mess with COMPET-N anymore (no time), but since everything is automated now, it could be done. I have to think more about it and discuss with some people for pros and cons. Sorting by columns is missing for instance and movie rows are displayed twice. There might be more but as mentioned no time. I was working on new CNDOOM lately. CNDoom is 2.0.3 and CNLaunch is 1.4.3 (I tried 1.4.4 before as well). CNDoom/CNLaunch are in C:\Games\CNDoom and inside that folder I have a WADs folder with all the PWADs and IWADs. I'm using Windows 7 64-bit. I tried completely deleting CNDoom and replacing it once and it didn't help. Also tried running as admin and got the same results. Yes, I do have two monitors. This might be related to Chocolate Doom then, try withlatest Chocolate Doom and see if you have the same problem and report to Choco issues. But you can try to disable one monitor and it might work just fine then, not sure as I can't try it. ps. can you explain me how are you trying to run PWAD's? Maybe a screenshot (ALT+Print screen) then save it with paint and upload somewhere then paste here link. Hi, sorry I didn't really have the time to respond, but I got the problems sorted out, partially thanks to dew's help, most of it was stuff that I screwed up. I think the reason the launcher didn't launch the PWADs was because I put them in a separate folder, as after I placed them in the same folder as cndoom.exe, it worked (even though previously, I set the path of my wads in the launcher's settings and the launcher saw the wads). Thanks, though! Glad you resolved it. New beta is reuploaded, new quickstart patch is in it so if you can test and report back results. First problem is that I get a black screen when using the cnlauncher and the Record demo option. However, it does work if I only select "Demo control:" but not check "Record demo" option. "Playback demo" option works fine, but I am unable to uncheck both options once I have selected one. As for the blackscreen itself, I am able to exit by pressing F10+Y and I do hear sound. Second problem is that I am not able to select 1600x1000 resolution in windowed mode. When I choose No fullscreen, No Fix aspect ratio and 1600x1000 it sets it to 1280x800 when running the game. set autoadjust_video_settings to 0 in your configuration file. Check if you get the same problem and\or let me know if you know of a solution. Ok, first tell my what's you monitor native resolution and second please try to run Crispy Doom and see how does that work for you with same display settings as in Competition doom. 1920x1080, same issue with Crispy doom. both values should be 70 or something like that. I tried chocolate doom from the link you gave, and it gives me 1600x1000 without changing to 1280x800. So everything works fine there. inside a 1600x1000 window with the area around the game window black, which is different from what cndoom does. cndoom launches the game and the window size is changed to the same size as the game window at 1280x800. I used the default values for the quickstart, same as I did for 2.0.2.1, but changing them to 70 fixed the problem. I just didn't think it was the issue since the value was the same as what I used before. Yes, quickstart and resolution was changed, that's why I said to create new config with cndoom-setup.exe. Did you try to run cndoom in window mode after fixing quickstart? I don't have such resolution as you (1600x1000) but I did test 1920x1080 on tv and 1600x1050 on laptop yesterday and everything worked as expected. If I use "Save parameters and launch DOOM" and the window is launched in 1280x800. Also same issue if I save config in cndoom-setup.exe and launch doom from either cndoom.exe or the cnlaunch.exe. If I then open cndoom-setup.exe again the 1280x800 is ticked off instead of 1600x1000. By setting "autoadjust_video_settings 0" it is initially launched in 1600x1000 but is then immidiatly changed to 1280x800 before game loads. before the window itself is reduced from 1600x1000 to 1280x800. By setting "cn_quickstart_delay 70" I get first a window in 1600x1000 followed by window immidiatly changed to 1280x800 before game loads. By launching the game from cnlaunch instead of cndoom.exe the resolution still changes to 1280x800 but the 1600x1000 option still remains ticked off when opening cndoom cfg afterwards. So I've tried different settings for cn_quickstart_delay, qsdelay_value and autoadjust_video_settings, but they all end up giving me a 1280x800 game window. So the reason this is not implemented is because it would produce game glitches. Well, if this is a big problem for you, you can still play old version and submit demos via email and I'll consider creating additional cndoom version or some fix in future. I will try to play in fullscreen when doing runs instead, shouldn't be too much of a problem for me. Also, the default value for Quickstart is 3000? I assumed that this was milliseconds, but now it's about 30 seconds instead of 3 seconds. With the recent problem I had with it perhaps setting the default value lower would be good incase anyone else get the same problem. ZeroMaster010 wrote: I will try to play in fullscreen when doing runs instead, shouldn't be too much of a problem for me. Default value is 50, but old cnlauncher packed with cndoom still has that value. Well, try new beta launcher as the value is fixed now. Also delete cnlaunch.cfg before starting new launcher. Hi, I recorded this demo: http://www.doomworld.com/vb/attachment. ... id=1346593 without specifying any category parameters, does that just mean it's invalid or is it salvageable without rerecording it (which I'm probably not going to do). Uhm, it can be fixed, I'll see what I can do, but please next time try to specify category. ...since I have no time to fix laggy mouse behavior in 2.0.3.1 I've enabled uploading of 2.0.3 demos, but this is temporary solution until new fix is out. Don't ask me when.. Please test how this one works. Loading a PWAD doesn't seem to work from the launcher (just loads IWAD instead). Going from playback demo to record demo will show quickstart as disabled in the launcher without being able to change it (unchecking and checking demo control fixes that though). Thank you for reporting, I've added them to bug tracker. Launcher is pretty buggy so avoid using this one. Competition Doom binaries are re-uploaded as I found one nasty bug. New build is up today, please do not use old Competition Doom config files when using new version as it might not work properly. This should work without issues except launcher. So please test if possible. Launcher will be fixed in next beta release. ps. Regarding PWAD's. I just tried to load PWAD and it's working fine. Maybe you just selected PWAD but you must click on checkbox to select it? The .dll files were missing from cndoom-2.0.3.2-beta2.zip, so I copied those from the beta1. When I turn quickly the window mouse pointer will pop up. That is, if I turn right quickly I will see the mouse pointer outside the game window on the right side. This also happens in v2.0.2.1, but only if I try to turn very very quickly, in beta2 it happens more frequently. Mouse settings are the same. I have for example SCYTHE.WAD checked, and Doom 2 IWAD selected, it will then load Doom 2, this happens in both beta1 and beta2. Well, that's windowed mode, there can't be done much about it, it is reported as a bug already for Chocolate Doom afaik but this should be solved with SDL2 (let's hope) so thats why it's ignored for now as they are working on SDL2 atm. For me personal fullscreen mode is the way to be played. I guess you are using windowed mode so you can have additional windows for routes and stuff when playing, am I right? Regarding loading pwads I can't reproduce the problem, tried renaming, uppercase and it will load scythe. But when game starts and scythe will not load go to your cndoom directory and c/p here content of stdout.txt and sterr.txt so I can see what happened. I've re-uploaded zip with dll files, try with them too. The issue was resolved by moving SCYTHE.WAD to the directory, so I assume the issue is the "Path to directory with WAD files:" does not work in the launcher, it still finds all the wads since it lists all of them, but it won't load unless they are in the same directory as cndoom.exe. As for window mode, there's a small visual advantage to doing glides, I can more easily see when I am close to the gap in window mode when I look at the edge of my game window. There's also some inconvinence when I use 2\3 monitors, since it won't load at 1920x1080 resolution (1280x960 instead) in fullscreen it's a bit annoying when alt tabbing to do other things while I practice runs. Not really a problem if I do any record attempts, but then the issue is that I want to just use the exact same settings as when I practice, in this case windowed. The mouse issue I had seems to be different every time I try a different install, I don't know why, but I assume I can work around it somehow myself. Edit: I'm not too sure about this mouse issue, I have no problem in v2.0.3.1 though, beta2 it is difficult to make quick turns at times. Can you try this windowed mouse issue with crispy doom as I guess it's related to hires patch. pps. just found out that even this build is not good. Since 2.0.2 I've changed my building environment for binaries and that's the main problem of all 2.0.3 builds so I'll try to fix it in next few days. But try crispy with windowed mouse. Changed from direct X to windows GDI in the setup and it works perfectly, no matter how fast I try to turn I am unable to get the mouse pointer outside the window which is perfect. I know i'ts much better in directx but I'm struggling with normal gdi mode. Don't know why but my binaries are broken. I spend 10 hours trying to figure it out, passing new flags, host, etc and at once I had a good compile but it was a bit old source, and after chenging source binaries are broken again. I guess it's related to compiling under vmware so I'll setup dedicated linux box and try that. Regarding 2.0.3.2 beta2 if there are no other issues soon it's considered as release. From now only demos from this version are accepted. So is this using the latest Chocolate Doom 2.2.0 (or is that not how it works)? I only ask because Choco 2.2.0 plays really choppy for me compared to past versions, like it's half the framerate or something. But cndoom-2.0.3.2 doesn't have this problem; it's still smooth. What's up with that? Anyway, about cndoom-2.0.3.2: It seems like half the time I use the launcher and start a level, I have no horizontal mouse look. It just strafes me. I then exit the game, and try again, and it's fixed. Is this a known issue, or...? And I was wondering: Can I change settings to my preference without it affecting the eligibility of my demo? Like, can I change the gamma, use music with the GUS sound emulation, etc.? I assume I can; I assume those things are separate from the actual demo recording data, and can be switched on or off for playback of any demo. But I just wanted to be sure. I'm not especially familiar with Doom or how it records demos. "Laggy" mouse / video is what I guess is SDL bug that was introduced with Chocolate Doom v2.0. Why and how? Because in v1.x Choco defaulted to directx video mode and everything worked fine but not for some people, so devs decided to automatically select video_driver and for some people this will default to gdi/windib driver that is meant for win9x systems, and for some, like me, will default to directx. I decided to put back option in setup to select directx/windib(gdi) as solution and if user didn't select anything it will default to directx so that's why cndoom works fine. It can be fixed too if you select color depth 16bit. This will probably go away with SDL2 I guess as I didn't have time to test SDL2 branch. I don not understand the problem with horizontal mouse look. Please explain it a bit detailed if possible. Copy/paste your cndoom.cfg to pastebin.com and provide link for inspection. I noticed that the check episode category doesn't work (can't change episode number), I uploaded new doom 1 episode 2 record and it is listed as E2M8 UV-speed. I also have a question regarding how the movie category for ultimate doom works in cndoom. Afaik, in cndoom only, you will continue from for example E1M8 to E2M1, which could be an intresting category for E1-E4. However, you get to keep your weapons from E1 into E2, which changes the game significantly and makes it a very strange category to do, so is there any possibility to force pistol start when switching episode? fx wrote: "Laggy" mouse / video is what I guess is SDL bug that was introduced with Chocolate Doom v2.0. Why and how? The mouse snag lag was happening for me even in Choco 1.7.0 with directx chosen in setup, and in later versions with directx specified in the config file. However, I think using the 16-bit color has lessened the severity and frequency of said lag for me to cndoom levels (need to test more to be sure). It also fixed that super choppy, half-framerate-looking problem I was having with Choco 2.2.0. I did some more testing with the mouse look issue. I've found out that it's actually a Choco problem, not cndoom. It happens sometimes when I first start up a new game or load a save (or maybe even after map change...I haven't tested that yet), and it happens quite often. I don't know what causes it or how to reliably reproduce it. When it happens, it's as if the right mouse button is being held down. This is by default the "Strafe on" key, which is why I couldn't mouse look. If I right click once, it stops and I can then play normally. I tried switching right click and the scroll wheel button defaults around, so right click would be "move forward", and indeed I would automatically start moving forward until I right clicked once to make it stop. But now that I know I can fix it with a single click, it's not really that big a deal, I guess. If the bug is related to chocolate doom, then please report it to choco issues so it gets fixed. I'll check and fix the upload. Regarding Doom movie, well, that's the way movies should be. Also, about the launcher: Why is there a "Nightmare" category tickbox? Doesn't picking the "5 - Nightmare!" skill setting in the "Start" tab already tell you that it's a Nightmare run? Like, am I supposed to tick both "Nightmare" and "Speed" if I were doing a NM Speed run? Or is the Nightmare tickbox only to be used in combination with episode/movie runs? And sorry about bothering you with all these questions recently. How many tyson or respawn or pacifist of nm100s demos were made last 4 years? Not too many, and almost any record from those categories can be beaten. Do I have to go further with explanation? fx wrote: Do I have to go further with explanation? Maybe. I don't see how "the records can be beaten" can be a valid reason at all. And if it's really that unpopular, then you won't need to worry about getting those kinds of demos anyway. - "Tyson" takes way too much damn time, and no one wants to sit through that crap checking for cheats, etc..
- "No Monsters" is just a dumb, lamer version of "Speed". - "Pacifist" is often the same as "Speed"; it just seems redundant. - NM Max: Finishing the level as fast as possible, in NightMare, with 100% kills (or more), and with 100% secrets. And "MMH" actually sounded kind of interesting. I wouldn't mind that making a comeback. We all have our reasons for some category, but I will not change anything. Nomonsters is accepted too, it's good for route optimization but it has to be sent only via compet-n form. I should fix that tho. Okay, but is there any particular reason for no "NM Max" category? Why does Compet-N instead have the separate categories of UV respawn, UV fast, and NM100s? That doesn't make any sense to me. But surely there must be a good reason, seeing as how there is no "NM Max" category in ANY of the demo databases. What am I missing? I'm pretty sure this is my last question. Then I'll stop bothering you and focus on trying to beat some records. Well, record 5 maps on NM max then we can talk further about category. When I think more about it, finishing even two maps on nm max would be a challenge. Someone could do it, that's for sure, but one or maybe two people on the world. Take a look at NM100S records, there are still MANY undone maps, and NM100S is just a part of NM MAX.. max would require much more. Half of AV/HR/MM/MM2 are empty. NM Max doesn't make much sense to me, as you can't easily track whether you've killed a particular monster due to respawns, unless you make it arbitrary that you need all secrets and 100% kills, which seems pointless. Respawn, Fast, and NM100 all attempt to achieve different purposes, and NM max would not replace all of them for reasons above. Nomonsters is my favorite category; it's quite good practice for movement skill and often removes really annoying RNG that would be present in a speed category on the same map. I think Tyson is cool, but it's definitely a niche and there aren't many runners of it; although there are enthusiasts, many don't care for either Compet-N or CNDoom anyway. Overall, I don't see much of a reason adding these categories to CNDoom; even with the existing categories the tables are still largely empty, so adding more seems like a waste of time to me. 4shockblast wrote: NM Max doesn't make much sense to me, as you can't easily track whether you've killed a particular monster due to respawns, unless you make it arbitrary that you need all secrets and 100% kills, which seems pointless. How's that different from "Respawn"? Wouldn't "NM Max" just be "Respawn" with fast monsters and double ammo? That sounds much more interesting to me. But I haven't played much "NightMare!" difficulty, so maybe I'll change my mind about it once I do. UV-Max doesn't work like that even though you can get 100% from arch vile respawning monsters, so it would seem strange to have NM-Max not use the same condition that everything has to be killed. UV-Max is all monsters dead at the end of the map, including respawns from archviles, not including lost souls or spawns from Icon of Sin. UV -fast is the same except with -fast. UV -respawn is different because all you need is 100% kills (so, even if all the kills happen to be spawns from Icon of Sin or if most of the kills are respawned monsters, it doesn't matter). NM max would either have to like UV max, which is difficult to track especially without an advanced HUD feature or like UV -respawn which is already a niche category and would probably be even less popular if it were also with -fast monsters. And as fx said, NM100/UV -fast/UV -respawn are all balanced such that they are possible on most IWAD maps, and many are possible even for movie runs. With NM max, it would be a lot harder to do most maps regardless of which set of rules you would apply to it, and it'd be a lot less interesting as a category as there'd be fewer possible runs. Seems that upload script is not processing demo correctly. Will look into that now. I've changed many things and details, try how does it work. and this is a fast mashup so there might be serious bugs, please test before recording real demos!!! I ran into a crash on Final Doom: TNT Evilution that doesn't seem to happen in chocolate doom. It's on map 30 of TNT by the cyberdemon, if I face the switch there and take to the right and look into the room the game will exit. I don't know if this happens in DOS version, and I couldn't find anyone mentioning it. edit: I'm not sure if this is what's called visplane overflow. This is actually happening other places in the room as well (all the way back and facing the entrance), I plan to do a full nightmare run of TNT, so naturally this is something I have to avoid at all costs. I believe the monsters have no effect so it should be fine if I just figure out where these crashes can occur and try to avoid them, but it's impossible to check everything. I tested chocolate doom, crispy doom, prboom+ and the steam (which is dosbox I believe) version and none of them crashes at these areas. So I assume this is a cndoom only thing, not sure if it's something that would be easy to fix. If not then I'll try to just avoid those spots, should be very unlikely that I run into another one if I ever get that far. Look into the stderror.txt after crash, is there anything? There's nothing in the stderr.txt, again I haven't run into it anywhere else besides these 2 spots on this particular map, so it doesn't look like it's going to be a problem for me. So whens The next version of CNDoom gonna be released? Last edited by 38_ViTa_38 on 11.09.2018 20:36, edited 2 times in total. It was removed by me obviously. I'd take it as that any plans to merge CNDoom with Chocolate Doom 3.0 (with some other fixes) is dormant (dead?)? Hello guys, I was checking what was going on with the speedrunning scene and saw this new port! Its great, congrats for the work you put in it. I have one question though, can the game be run in higher resolutions and still record valid demos? Yes, you can setup higher resolution but it will be just stretched, nothing else. Ok. I'll have to try this before I make up my mind about joining cndoom or continue with c-n. I still have an old win98 pc that I got back in the day just for speedrunning. It would be beneficial if we could merge both though. I was watching some Goldeneye speedruns which has quite a strong community and thought we could emulate some things from them. Like awarding points for a tied record for example? A lot of c-n records could be done on cndoom that way and fill up the tables.